In-form grey Albumin’s mission at Rosehill on Saturday is squarely focused on ticking the 1200m box. Trainer Gerald Ryan is keen to set the rising four-year-old for a series of sprint races through the summer months but that requires him to be certain six furlongs isn’t beyond Albumin. To that end the gelding chases a hat-trick in the Tab.com.au Handicap (1200m) at Rosehill at what will be his sixth attempt over the trip. “We’re going to 1200m to see where he’ll go next preparation,’’ Ryan said. “This could be his last run or he could have one more. He’ll be aimed at the Summer sprints in December and January. Ryan has his sights on a succession of Listed races like the Starlight Stakes (1100m), Razor Sharp Stakes (1200m) and Christmas Classic (1200m) plus the Takeover Target Stakes (1200m) in January. Albumin has contested eight races at 1200m and beyond for one second placing at Canterbury in August but he was beaten 2.4 lengths by Viridine in the Group 2 Roman Consul. Ryan said he can’t fault Albumin, who opened $4.20 TAB favourite, going into Saturday’s race following his back-to-back wins over 1100m on his home track and with a dry surface likely he’ll have his chance. Last start, back on June 16, Punters Intel shows he recorded a slick 34.34 seconds for his last 600m and ran the fastest last 200m in 11.52 as he ran down stablemate Tango Rain. “He’s still working the same, eating the same, feeling the same, he gives every indication he’s going as well,’’ he said. Star Of Monsoon has been treading water for a few weeks after rain caused his resumption at Canterbury last month to be put on hold. But there’ll be no such concern heading into the TAB Rewards Handicap (1200m) though Ryan hopes the gelding hasn’t suffered from boredom waiting to make his return. “He’s been ready for a while. We got that rain and it was a heavy track, he had 61kg so I scratched him,’’ he said. “We’ve hung onto him for a month so I just hope he hasn’t gone off the boil. In five starts as a gelding, Star Of Monsoon has won twice at the provincials and was city placed in three consecutive starts in the summer. He was narrowly beaten by Tip Top when he last raced back on March 7. 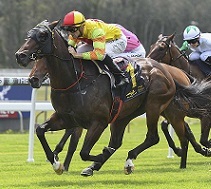 Ryan is hoping he’s pulled the right rein with two-year-old Tactical Formation running in the Australian Turf Club Handicap (1400m) in preference to a maiden at Wyong. Tactical Formation, a $5 chance with TAB, has been freshened up since he was beaten at $1.75 at Gosford on May 31 but was readied to race with a jump out last week. “He’s run placings in inferior company but he’s going well. Things are going to have to fall right for him,’’ Ryan said.